No more weeds and ants on your pavers! Techniseal RG+ Polymeric Sand offers a complete and final solution for the joints between your pavers. Our highly effective jointing sand mix allows the joints of your pavers to retain their original appearance for as long as possible, by repelling ants and other insects and by preventing weed growth. If you are a contractor, make sure you offer you customers this original and top-performing product - Techniseal RG+ Polymeric Sand uses a brand new technology - it is the ideal product to rid your driveways, patios, walkways and any other outdoor surfaces of weeds and insects. For false or wide joints, high-humidy or high-traffic areas, we recommend the use of the HP2 Polymeric Sand. Made from the highest quality graded sand and binder - our specially formulated polymeric sand can be used to fill in paver joints. This polymer sand can be used on pavers or slabs and must be installed over a draining bedding. The flexibility of the product makes it unique - it works to stabilize pavers and adjusts to the movements of surfaces. It will never crack and it will remain permanently in the joints. RG+ paver sand is very quick and easy to use. The sand is applied dry and it begins to harden within a few minutes after wetting. It quickly becomes resistant to erosion caused by water (for example; rain, irrigation and spray). 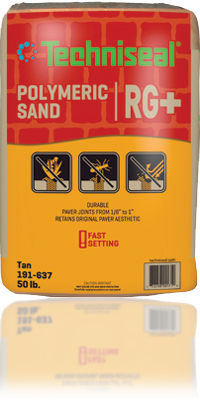 Once dried and cured, this jointing sand prevents the invasion of insects and repels weeds.